ISIS claims Tunisia bombing that killed 12 members of presidential guard. 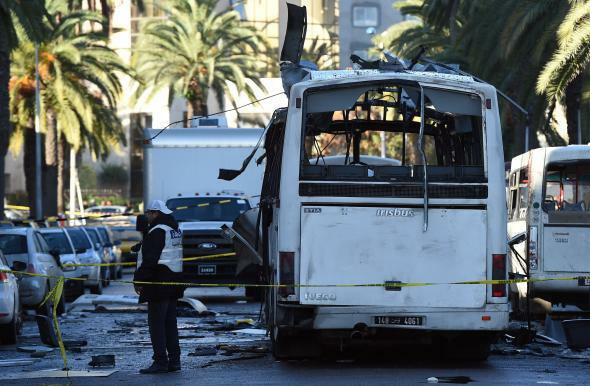 Police inspect the wreckage of a bus in the aftermath of a bomb attack in Tunis on Nov. 25, 2015. ISIS claimed responsibility on Wednesday for another deadly terrorist strike in a recent string of attacks, this time in Tunisia. The attack took place on Tuesday on a bus carrying presidential guards in the capital of Tunis when a suicide bomber detonated what is believed to be a backpack or a belt, killing 12 officers. Officials say the explosives likely came into the country from Libya. The blast, which also wounded 20 others, prompted the government to declare a state of emergency, temporarily close the airport and tourist sites and impose a curfew. Officials also closed Tunisia’s southern border with Libya for 15 days beginning on Wednesday… Tunisia is the lone country that, after the Arab Spring uprisings, established a genuine democratic transition by adopting a new Constitution in 2013 and holding its first national presidential elections in 2014. But the transition has been marred by attacks by extremist Islamist groups, including two this year that killed more than 60 people at the National Bardo Museum in Tunis and at a resort hotel in Sousse, about 87 miles south of Tunis. Many of the victims were foreign tourists.